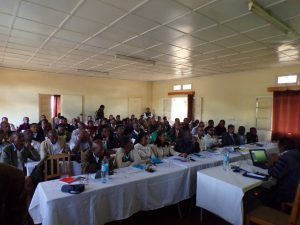 The National General Assembly of the Peasant Coalition of Madagascar (FTM / CPM) was held at the FAFIALA Center- Ambohimangakely, Antananarivo from May 30th to 31st and was attended by 61 participants from 22 regions of Madagascar. As a General Assembly, it is well stipulated in the agenda, the reports of the activities of each region, as well as those conducted by the FTM / CPM at the national level, the validation of the statutes and internal regulations governing the organization so that the FTM / CPM can work in an efficient and responsible way. In addition, there was also validation of the Values ​​Charter so that members could optimize their working conditions and collaborations in the execution of their work. Lastly, during this General Assembly, new members of the Board of Directors, numbering eleven (11), were also elected. At the end of this election, Mr. RAKOTOMANDIMBY Hajasoanirina, a farmer from the Bongolava Region is elected Chairman of the Board of Directors (PCA) of the FTM / CPM.